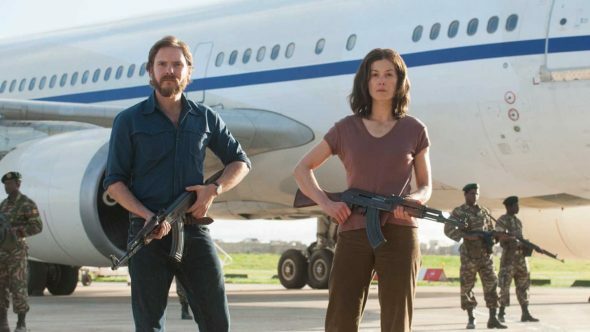 A film that sells the importance of negotiation while it details a harrowing plan of action, 7 Days in Entebbe gets caught in the awkward space between show and tell. In July of 1976, Israeli Defense Forces invaded Uganda’s Entebbe airport for a daring rescue of hostages from a hijacked jetliner out of Tel Aviv. Bolstered by the support of Ugandan dictator Idi Amin, the terrorists were seeking the release of 40 Palestinian militants – as well as 13 other prisoners around the world. As Israeli Prime Minister Yitzhak Rabin (Lior Ashkenazi) weighed his options, Defense Minister Shimon Peres (Eddie Marsan) led the chorus calling for military intervention. Director Jose Padilha (Elite Squad/the Robocop reboot) assembles the drama with precision, beginning with the motivations of German hijackers Wilfried Bose (Daniel Bruhl) and Brigitte Kuhlmann (Rosamund Pike). Padilha’s approach is detailed and informative, but often prone to favoring exposition over illustration. Leading an outstanding ensemble cast, Bruhl and Pike both give terrific performances, letting us glimpse the early commitment of their characters and a growing disillusionment when the ordeal drags on. As the weight of the hijackers’ German heritage grows heavy amid their Jewish captives, the pair deal with their guilt in different ways, both finding an effective authenticity thanks to Pike and Bruhl. Gregory Burke’s script has moments of bite (“You’re here because you hate your country. I’m here because I love mine.”) but retraces its steps too often, and the film feels like it’s running in place. Even more problematic is a curious approach to the actual rescue, when tension is undercut by the need to draw parallels with a well-rehearsed dance performance. The payoff the film needs to resonate as more than a well-produced history lesson never materializes, and it leaves shrugging its shoulders at the elusive nature of peace.